This post originated when I began to model Indians in Poser (a 3-D computer modeling program) for my own amusement and as a way of learning how better to use that program. (Indians at around the time they first met with Europeans and through early Colonial days did not wear much in the way of clothing, making the models easier to make.) But the obvious initial question was “who did they look like?” My curiosity was driven from an early illustration my Dad had sent me of an Indian miner on the shores of Lake Superior in the early 19th Century. I imagine that he was mining for copper, (native in the region) and I was struck by his appearing quite European. Figure 1. 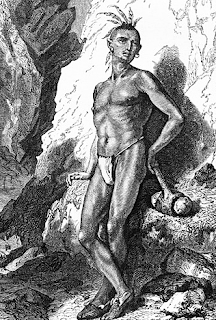 Sketch of a 19th Century Native American miner on the shores of Lake Superior. This is also how Robert Griffing (a currently popular painter of early Indian encounters) has been painting them. Given that this seemed to conflict with what I remembered of their origins, which was that they crossed into America from Asia, I began to read the odd book on the subject, and since it has a little to do with earlier climate changes, I thought to write a post on where I see the state of the current debate on the subject. When I started writing this I thought it would be relatively easy to just find a couple of references with the dates, from which the European influence would be easy to pick out. Well, after re-writing this post several times, I have to confess that was a bit naïve. It turns out that there are several controversial pieces of information out there, which mean that this is not the simple story I had expected to tell. And that one post is multiplying into a short series. For a start there are several different groups that might have made the migration from Siberia, although recent results from the Genographic Project suggest, according to Dr. Wells that their results favor the group that started in Mongolia. Then there is the question as to when the original group came. The oldest excavated archeological site in Alaska is at Swan Point and dates from about 14,300 years before the present (BP). But there is a site in Southern Chile, at Monte Verde which may date as early as 14,220 BP, and David Meltzer (in “First Peoples in a New World”) noted that there was some site evidence that might go back as far as 33,000 BP. The debate on when Europeans first arrived on the American continent has grown to include debate on both the shapes of the early weapons that were used, and the origin of the “Clovis Point” point shape that became most common, as well as the more recent debate on the origin of one of the genetic markers (the X2 haplogroup) that appears in members of a number of Indian tribes. As I read more material, the different views became more complex to explain, and so one post is now morphing into three or more, particularly given the recent press release from UCSB on a paper that has evidence of a meteor strike which initiated the Younger Dryas cold period some 12,900 years ago. 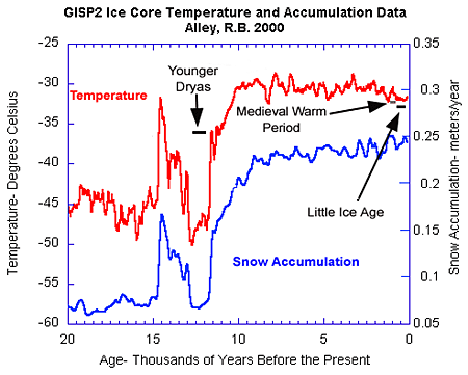 These new data are the latest to strongly support the controversial Younger Dryas Boundary (YDB) hypothesis, which proposes that a cosmic impact occurred 12,900 years ago at the onset of an unusual cold climatic period called the Younger Dryas. This episode occurred at or close to the time of major extinction of the North American megafauna, including mammoths and giant ground sloths; and the disappearance of the prehistoric and widely distributed Clovis culture. I do not plan on getting into the somewhat detailed and complex set of arguments as to what was the cause of the Younger Dryas. Some say it was caused by the collapse of a very large ice sheet covering North America that flooded the Atlantic and changed the circulation patterns for a while, others – as above – point to the evidence of meteoric impact. But it does give a point of reference relative to the time periods involved. 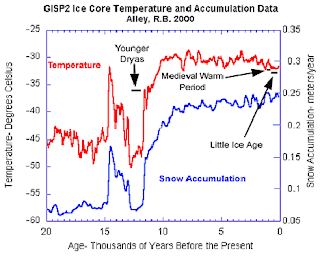 However, even as I was writing this new version, there is apparently some new controversy over the temperatures that have been calculated in Greenland, with Anders Carlson at University of Wisconsin –Madison suggesting that the temperature drop may be smaller than that shown above (perhaps half). A second original question related to the exact color of the paint that covered the Indians at the time of first contact, since it was reported that while wearing few if any clothes, Indians often were covered in some form of red paint. (And for now I’ll be mainly talking about the East Coast, though there are texts that cover the West.) Well this led into a discovery of the Red Paint People, which also feeds into the debate that apparently has been going on, with some intensity, among archaeologists, as to where that culture came from and where it went, some 7,000 years or so ago. And then, as a more recent source, there is the discussion as to exactly how much influence, if any, that the Vikings exerted when they dropped by the coast some thousand years ago or so. So perhaps three different time frames, and maybe therefore three posts. With no apology, this is the background upon which I, an admitted layman, am going to try and discern the current state of the evidence and belief, after having read recent books, articles and posts. It will include the odd thought on survival characteristics, and the possible creation of “journeymen” flint-knappers along the lines of the journeymen blacksmiths of which my great-great grandfather was one. But, since this post keeps increasing in length beyond this point, I will conclude this introduction with a few comments about the land that was above water at the time that the first settlers arrived. Figure 3. 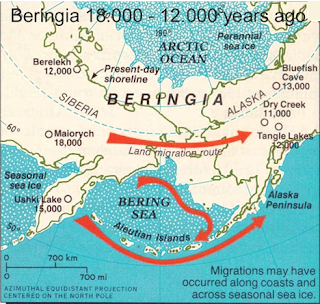 The Beringia land bridge from Siberia (Thinkquest), over which the PaleoIndians entered the American continent. Historians have long considered that North America was populated by a migration of some size from Siberia into Alaska, and then down into the body of what is now the United States. 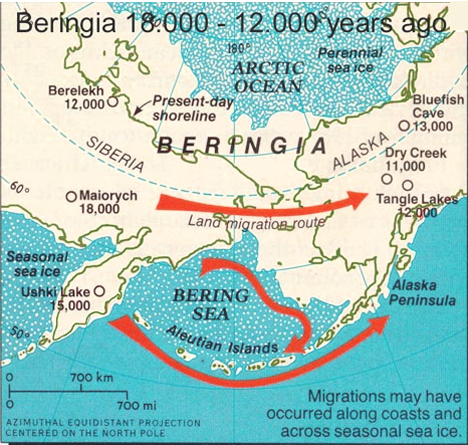 With the ebbing and flowing of the ice sheets the land route is thought to have first crossed on the dry land between the two continents, an area which has been given the name Beringia. From Beringia there has been debate as to whether settlers moved down the Mackenzie Valley, and thus inland, or down into the present USA along the coast. Since that coast is now underwater it is more difficult to look for archaeological evidence of this alternative, but there is increasing evidence (including the DNA information which I will discuss in a later post) that the migration could have followed both routes. When these hunters arrived both mastadons and mammoths still walked on the continent as shown by the presence of stone spear points near the remains of some of these animals. (You needed spears to get through the skin, arrows – as Stanford and Bradley pointed out – work better when, in later years, bison were more prevalent). And next time I will about some of the controversy that these spear point shapes has brought into the argument. Thanks for the reference, I'll look it up and see if any of it ties in with where I plan on going with this mini-series. However each time I find a little more evidence it can raise as many questions as it answers - I did not realize how much of this was still controversial. I find a little more evidence it can raise as many questions as it answers.